What happens when one energetic, well respected jewelry-making blogger and 26 talented beaders connect through social media and end up swapping their leftovers? You get a mélange of projects bursting with every flavor imaginable! Each designer was given a focal bead, a unique clasp, and coordinating beads, and was charged with creating a dynamic piece of jewelry. These artists push their own boundaries to come up with new combinations and original pieces. It isn't often that I get to combine my love of books and reviewing them with my other love which is jewelry design so I consider this to be my lucky day. It is almost like I hit the jackpot especially since I really loved BEAD SOUP. Do not get discouraged thinking that this isn't a book for all levels of experience as there are instructions in the back of the book covering the techniques. So take your time and soak up all the inspiration of this wonderful recipes. Lori and her contributors really think out of the box with their bead soups. And it has quite a lot of helpful tips that had me wondering why I had never thought of that. 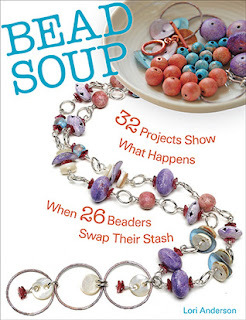 Some of my favorite pieces in the book were Stone Soup, with its tips on creating a unique chain, the Handmade Soup Bowl and the Blue Onion Soup. I just know that everyone will have their own favorites and I would love to hear about yours. As you can tell I really enjoyed this book and I rate it a 4.7 based on how inspired I feel after drooling over all this great designs. If you do design jewelry I definitely recommend this book. ***I purchased my copy at Amazon.com. **** Edited as I had missed a whole section of the book. Wanted to say one thing about it not beinga beginners book because it doesn't cover individual techniques -- there are pages in the back that do cover how do basic things like make loops, etc. It was purposefully made, like many books now, to not have "call outs" in the tutorial because of those pages. Of course if anyone needs help, I'm always here to assist. I totally missed that and I am sorry. Going to edit my review. And yes Lori is absolutely wonderful. If you ever need any help just drop her a line.